CalPoly’s Rose Parade Float was Certified California Grown on December 31 and received the Past President award from the Tournament of Roses for most outstanding innovation in the use of floral and non-floral materials on January 1. PASADENA, Calif., Jan. 1, 2018 — The Certified California Grown 2018 Rose Parade® entry from Cal Poly Universities has earned the Past President’s Trophy, an award that recognizes outstanding innovation in the use of floral and non-floral materials. The float, designed, constructed and decorated by students from California Polytechnic State University, San Luis Obispo and California Polytechnic State University, Pomona, included nearly 97 percent of cut flower and greens from California. 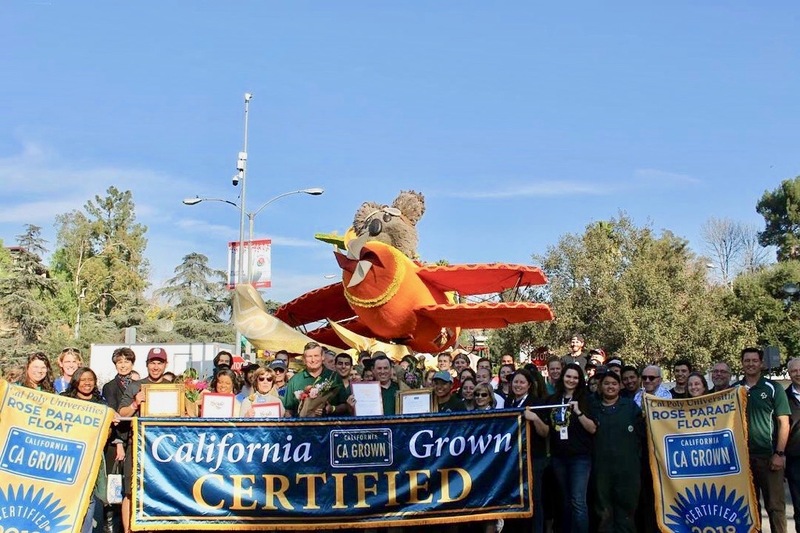 The float earned California Grown Certification at a ceremony Dec. 31 led by California Secretary of the Department of Food and Agriculture Karen Ross. 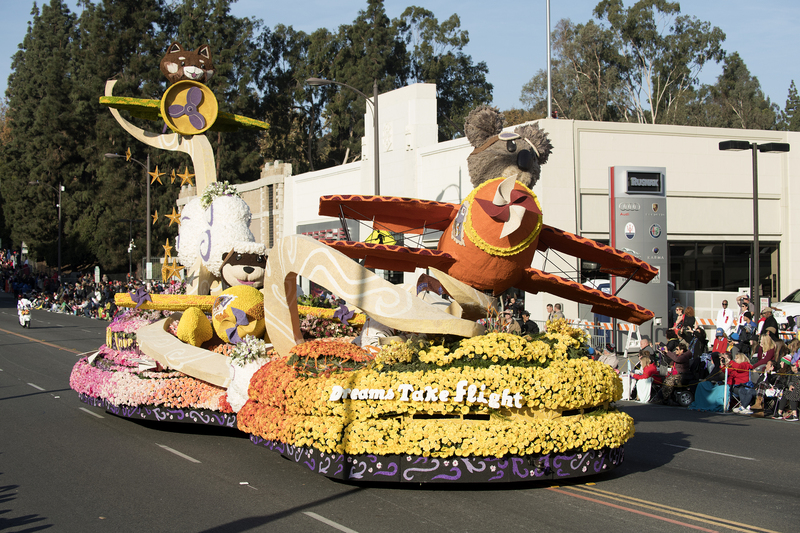 Certified floats must be decorated with more than 85 percent of cut flowers and greens from the Golden State. This is the seventh year that the Cal Poly float has earned California Grown certification. California Department of Food & Agricluture Secretary Karen Ross officially certified the CalPoly float as California Grown for the 2018 Tournament of Roses Parade. Titled, “Dreams Take Flight,” the float invited onlookers to take flight on the airplane wings of a trio of cuddly critters — a koala bear, sea otter and red panda. The 18-by-54-foot entry used animation to breathe life into its trio of amiable aviators as they swooped and swayed amid the clouds. Paula the Koala, the largest element on the float, flew a striped-red biplane, controlling the craft’s flaps, rudders, ailerons and elevators as she glance between the sky and the audience. She led Ollie the Otter’s seaplane, which emerged from a cluster of moving clouds, while Rusty the Red Panda soared behind, banking left to right, some 28 feet above the float. The float was adorned with over 40,000 stems of California Grown blooms — including 10,000 roses, 10,000 Gerbera daisies and 1,000 irises. The bulk of the float was festooned with mums: 12,000 chrysanthemums; 7,500 yellow button mums; 3,000 green button mums; 1,000 orange cushion mums; and 500 purple cushion mums. The flower farmers of California provided the student’s of CalPoly with thousands of stems of beautiful CA Grown flowers and greens for this year’s float design. The flowers and foliage were donated by California flower farmers. The white and lavender statice used on the float was grown by students at the San Luis Obispo campus. The Tournament of Roses Parade® is a New Year’s tradition where nearly a million visitors line Colorado Boulevard in Pasadena to view the beautiful floats first hand, and millions more watch from their homes across the country. 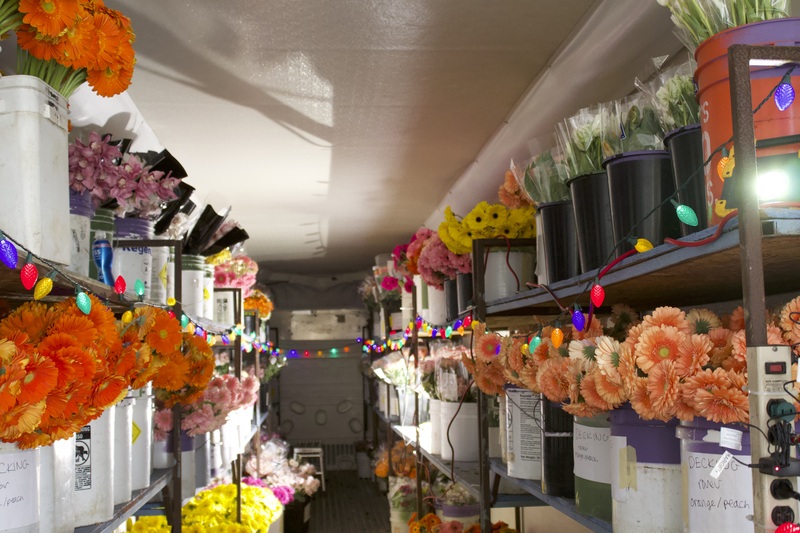 The California floral industry has a $12.2 billion annual impact on the state’s economy. California’s flower farmers represent over 4,500 jobs and contribute $1.7 million to California’s economy every day.